He’s overpaid, and attention to this has been underpaid. The University of Minnesota president receives an annual salary of $610,000 plus an annual contribution of more than $75,000 to his retirement plan, plus other benefits, including free housing (“6-figure pay to run a public college,” June 8). In 2013, the IRS released its final report on its compliance project on tax-exempt colleges and universities. The average total compensation of presidents of large universities was $399,723, and the median amount was $337,881. The U president is not the CEO of a commercial business. He is the head of a nonprofit institution of higher education. The law restricts the pursuit of personal wealth by the leaders of private, tax-exempt organizations. Section 4958 of the Internal Revenue Code imposes an excise tax on excessive compensation paid to senior administrators at private colleges. The section does not apply to public universities, as those institutions are classified as units of government. But we must be concerned with the reasonableness of the compensation of senior administrators at the U — and not simply by comparison to compensation levels at other large public universities. Until recently, no one has been watching the store anywhere in higher education. It’s not U President Eric Kaler’s fault that he measures success by the salary he deserves as the CEO of a $3.5 billion business. He’s been taught, like the rest of us, that money is the barometer of achievement. And it’s not his fault that a tuition hike is needed at the U to cover things such as his $610,000 salary. He runs a large corporation, not a kitchen table where a student and his parents are working out their budget for the fall. And, after all, Kaler is competing with the U’s sports coaches, whose salaries are double and triple his. But true success isn’t about money. It’s about assuring that the CEO doesn’t earn more than 20 times the salary of the lowest-paid employee (see Ben & Jerry’s CEOs). It’s about paying your employees for a year when your mill burns down, as Aaron Feuerstein did in 1996 in Massachusetts. Success is about knowing that raising tuition may mean that some students will have to leave college, about knowing that $610,000 is more than you will even need to live well on. Success is about caring more for the world around you than for your ranking in the Big Ten pay scale. But then we don’t teach executives to distinguish between success and true success, even in the business ethics courses now springing up in most M.B.A. programs. Shame on us. As a 2013 graduate of the University of Minnesota, I was appalled by the May 31 “counterpoint” from university President Eric Kaler. As a student, I was active sharing my comments, concerns and criticisms with Kaler and his staff. 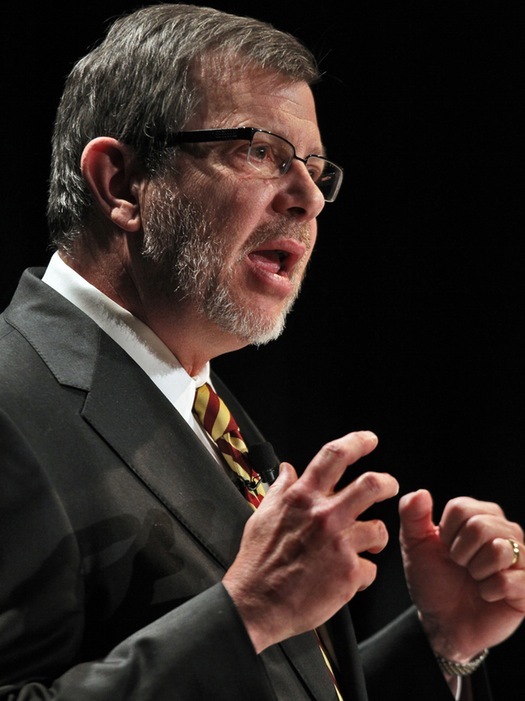 I have always believed in the excellence of the University of Minnesota, but that faith does not extend to Kaler, his administration or our Board of Regents. The fact that Kaler cited numerous reviews that span a decade highlights continued failure. Further, the report concluded Dr. Stephen Olson’s research had “numerous” conflicts of interest, adding that he had “inappropriately” delegated work in research that involved people’s lives. I wonder then what kind of accountability we are getting when Olson continues to influence students, staff and the department? We have yet to see Kaler do more than pay lip service to these issues without demonstrating the courage to act. Yet why would he or the Board of Regents feel compelled to act when there is no accountability? We cannot continue to have good faith in those who have routinely and consistently failed us. Professor Naomi Scheman is a member of the group selected by University of Minnesota President Kaler to come forward with new policies to rectify the mess that is clinical research at the University. As a member of the implementation team at the University of Minnesota whose recommendations concerning human subjects protection are being hailed as “Markingson’s legacy” (“The best thing for the U now is to move forward,” May 31), I need to demur. While I think our recommendations if seriously implemented will greatly improve human subjects protection, the ground on which that edifice will stand is still problematically unstable. Unanswered questions and failures to hold individuals accountable remain and need to be addressed. Furthermore, credit for what we have accomplished is misplaced. Neither the team nor the external review on whose recommendations our work was based would have existed but for the efforts of Carl Elliott and his colleague Leigh Turner. Those of us in the Faculty Senate who called for the outside review deserve credit only — and this is no small thing — for refusing to go along with the clear message from successive administrations that Dr. Elliott was not to be taken seriously, and that while academic freedom afforded him some protection from direct retaliation, others’ academic responsibility lay in shunning him. The university administration owes Profs. Elliott and Turner an apology and a debt of gratitude, but, most important going forward, it needs to grant them the credibility they have earned. The writer is a professor of philosophy at the University of Minnesota. It seems to me that President Kaler at the University of Minnesota thinks if he words things just right, people will believe what he says. So he says the same things over and over in a slightly different way and then seems surprised that we all don’t say, "Oh, I see, everything is fine now" and leave him alone. And it is, with an action plan on ethics in research that has the potential to be a national model. Difficult ethical issues are inherent in medical research, especially clinical trials involving human subjects. Research holds the promise of finding lifesaving treatments, but it sometimes depends on the participation of vulnerable patients suffering from serious illnesses. We at the University of Minnesota take seriously our responsibility to patients participating in clinical studies, and our critics are wrong when they assert that we have turned a blind eye to our ethical obligations [“Medical research: Honor code still needs strengthening,” a May 27 commentary by U Prof. Carl Elliott]. Let me be clear about Dan Markingson’s 2004 death by suicide, which is at the center of much of this conversation. The events have been the subject of many proceedings, including two reviews by the U.S. Food and Drug Administration [2005 and 2015], a lawsuit in Hennepin County District Court , complaints to the Minnesota Board of Medical Practice against two doctors [2009 and 2010], and a review by the legislative auditor . In this attempt to deny responsibility, the question is teleported to the clinical study. While the clinical study itself was nothing to write home about, what’s on the table isn’t the clinical study. The Protocol is clear, patients who didn’t respond were to be withdrawn. So a grossly psychotic patient with lethal delusions and disorganized thinking was in full view, not responding to the study medication, and nobody noticed, in spite of being confronted about that by Dan’s mother repeatedly [see making sense…]. Dan wasn’t studied clinically. The measure in the U Faculty Senate has passed! Kaler on Faculty Senate resolution: "It’s not a review of the Markingson case"
Critics are important voices, but there comes a point at which criticism of past actions stops being a catalyst for reform and, instead, becomes a barrier to necessary change in the future. We can’t change the past, but with vigilance, dedication and integrity, we will move forward. I promise all Minnesotans, our faculty and students, and our future patients and their families that the University of Minnesota’s human subjects research program will soon be a model for other universities. Other U·of·M Administrative types are accusing Carl of sticking on this issue as résumé padding and book selling COI, this criticism documented by a U·of·M colleague blogging on The Periodic Table [see For the Record: U·of·M faculty member of Academic Freedom and Tenure Committee Steps Over Line? and For the Record: More foolishness from a member of #umn Academic Freedom and Tenure Committee]. Neither passion nor perseverance are conflicts of interest in my book – they’re expressions of interest of the best kind. Professor Cohen continues commenting on the Strib. See earlier post for more examples of his behavior. "You miss the point.I think most published works have good and bad reviews and Elliott is a faculty member at a major university.He has credentials, it is not the argument.No matter, if his commentary lacksobjectivity, if he personally benefits by résumé ‘padding, if he basks in the attention, then he has conflicts of interests that need to be considered.Like FOX news, the story may be of an important event, but the bias makes the report suspect.No matter how many liked his book, his lack of objectivity is on the record." So according to Professor Cohen, Dr. Elliott lacks objectivity, benefits by resume padding, and basks in attention which means he has conflicts of interest? This man definitely has great potential for administration at the U of M, but not for serving as a member of an academic freedom and tenure committee. For the Record: U of M faculty member of Academic Freedom and Tenure Committee Steps Over Line? Carl Elliott apparently feels he has some special insight or unique knowledge of clinical research practice because he repeatedly faults President Kaler for not meeting with him to gain this critical information.His curriculum vitae provides little to warrant this claim.Instead, it shows a significant enhancement of his professional accomplishments attributed to his very public rebukes of this University’s administration by him over the years.His online presence links this activity with advertisements for his book ‘White Coats, Dark Hats’.Similarly, Leigh Turner’s CV is enhanced by almost two pages with 22 items entitled ‘Public service & scholarship requesting an investigation of psychiatric clinical research at the University of Minnesota.’Matthew Lamkin’s CV similarly benefits from such ‘accomplishments’.When, in the course of academic pursuits, does scholarship cross over into vested interests/conflict of interest? Maybe their expertise into bioethics makes them so insightful into ethical dilemmas that the fact that their actions embellish significantly their own disciplinary credentials is not important and we should remain attuned to their professional demands for righting the university?However, as Sally Satel notes in her review of ‘White Coat, Black Hat’ “…Carl Elliott’s sensational and depressing message, which is that most doctors are dupes and the rest are corrupt” makes one wonder about full objectivity.Ms. Satel notes her concern that ‘The Wild West days of free-ranging drug salesmen, lavish gifts, and pharma-scripted talks are largely over. But Elliott’s book unfortunately keeps alive the impression that corruption, both subtle and overt, is rife.’“Without actually intending it,” Elliott writes, “we have constructed a medical system in which deception is often not just tolerated but rewarded.”Is this, as Ms. Satel seems to imply, sensationalism for the sake of book sales or a committed scholar who fails to recognize change? It is this lack of any premise of even-handedness along with a clear track of conflict of interest, from resumé padding to book sales, which has me questioning the motivation of these colleagues.As the Rush Limbaughs‎ and Fox News of the world have found, unbalanced pictures of complex situations can make for some handsome rewards.Ethical decisions almost always involve judgments of facts and situations that are subject to various interpretations and influences – judgements that typically are in the gray area without a clear black/white delineation. Lack of objectivity or even the perception of the lost even-handiness can exclude an individual from having their opinions taken seriously.Have these three clearly crossed that line? As members of the University of Minnesota faculty or its alumnus, these professors have an innate conflict-of-interest when attacks on the university enhance their resumé and thus, as bioethicists, should recuse themselves from active participation.The response of President Kaler and his administration has so far been professional and even-handed, and he has brought outside reasoned analysis of the situation to focus rightly on better ways forward.That way forward to a better future is complex, will require lots of thoughtful deliberation, and is likely to be a rather rocky-road to travel with changes in processes, academic focus and research cultures.This university deserves and hopefully will reap the benefits provided from both continued thoughtful and studied input from outside and informed and debated directions provided best through the processes of faculty governance. I've posted earlier the commentary by President Kaler in the Star-Tribune which was published yesterday. Dr. Steven Miles, a nationally recognized University of Minnesota bioethicist and a member of the team that wrote the report, called this plan “Markingson’s legacy” and said he hopes the plan will be a national model. “Having taught medical ethics now for 34 years, I think … this is possibly the most robust policy I’ve ever seen,” he said. Difficult ethical issues are inherent in medical research, especially clinical trials involving human subjects. Research holds the promise of finding lifesaving treatments, but it sometimes depends on the participation of vulnerable patients suffering from serious illnesses. We at the University of Minnesota take seriously our responsibility to patients participating in clinical studies, and our critics are wrong when they assert that we have turned a blind eye to our ethical obligations (“Medical research: Honor code still needs strengthening,” a May 27 commentary by U Prof. Carl Elliott). Let me be clear about Dan Markingson’s 2004 death by suicide, which is at the center of much of this conversation. The events have been the subject of many proceedings, including two reviews by the U.S. Food and Drug Administration (2005 and 2015), a lawsuit in Hennepin County District Court (2008), complaints to the Minnesota Board of Medical Practice against two doctors (2009 and 2010), and a review by the legislative auditor (2015). As the legislative auditor concluded, we can never know if Markingson’s tragic death was the result of a clinical study conducted at 26 sites, including the University of Minnesota. However, it is clear we could have done better in our response to the concerns raised about these events. I have apologized to Dan Markingson’s mother, to a legislative committee and at public forums. In addition to recognizing and respecting the personal grief of those closest to Mr. Markingson, I believe the most meaningful way for an institution to apologize to the broader Minnesota public is to be better in the future. That is what we are doing as we move forward. The university, the nation’s ninth-most-active public research university, is implementing far-reaching reforms to our human subjects protection program. Our goal is to be a national model, both ethically and operationally. Last week, a faculty-led implementation team produced a 68-page action plan (http://tinyurl.com/l735b3s) to achieve this goal. This plan reinforces our commitment to an ethical culture, minimizes conflicts of interest, creates more robust institutional review boards and oversight, and vastly improves our approach to research involving people who have impaired decisionmaking capacity. I intend to implement this plan fully and with complete transparency, and I encourage you to watch us closely and judge us fairly as we do our work. When I came to the university in 2011, I reviewed the concerns that some had raised about the Markingson case. I also reviewed investigations of his death from the U.S. Food and Drug Administration, the Board of Medical Practice and the courts. Those are the independent bodies responsible for finding facts and resolving issues in matters such as this, and all of them have affirmed our compliance with laws and regulations. To their credit, our university faculty wanted further assurance that our current program was at the highest levels of ethics and science, and in December 2013 the Faculty Senate requested an independent external evaluation of our human subjects protection program. The Board of Regents and I strongly endorsed that recommendation and took immediate action. The panel’s proposals for reform and improvement were so thorough and far-reaching that this spring when the Legislative Auditor issued his review, he adopted the panel’s recommendations in their entirety. I came to the University of Minnesota less than four years ago, becoming president at a time of enormous change and challenges for all postsecondary institutions. On many fronts, great progress has been made. We renewed our partnership with the state of Minnesota; tuition increases have been reined in; graduation rates are at an all-time high; administrative costs have been reduced substantially, and the quality of much of what we do has been enhanced. But Minnesotans rightly hold everything done under the name of the “University of Minnesota” to the highest standards of excellence. Minnesotans know that even before there was a state of Minnesota, there was a University of Minnesota. Pride in the university’s legacy and in its importance to all Minnesotans runs deep. I take that very seriously. Critics are important voices, but there comes a point at which criticism of past actions stops being a catalyst for reform and, instead, becomes a barrier to necessary change in the future. We can’t change the past, but with vigilance, dedication and integrity, we will move forward. I promise all Minnesotans, our faculty and students, and our future patients and their families that the University of Minnesota’s human subjects research program will soon be a model for other universities.